There is only one thing you can do to detox from an experience like the Petronus Towers/shopping mall experience…I went straight to the KL aquarium to get some fish to eat my feet. Minna (Tina’s cousin) actually sent me this recommendation before I left. It is that thing where you stick your feet into a tank with certain kinds of “therapeutic” fish in it, who enjoy eating feet. I didn’t end up going to the one she sent to me, because this one came insanely highly recommended by some Malaysian blogger I cannot find now. It is called the AQUA SPA and is in the KL Aquarium. They make everyone wash their feet thoroughly first, they change the water multiple times a day and they are trained to look at feet and detect problems to keep bad things out of the tank. 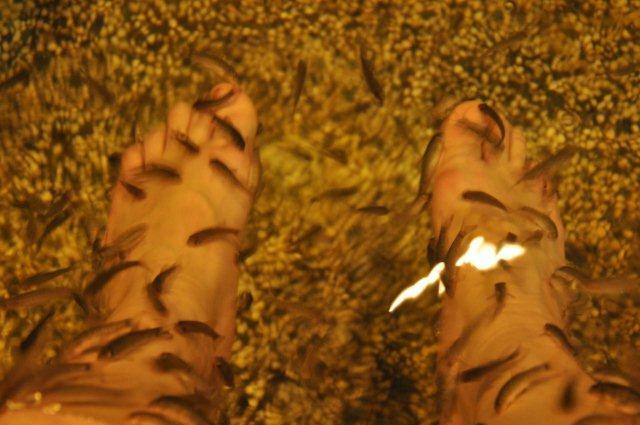 Anyway, after I washed my feet, the woman led me to a tank with the little fish first so I could get used to it…here are my feet getting eaten. I am glad these are not piranha. Man, I wish I could say that I found the whole thing obnoxious. It did feel freaky at first, but then I got used to it and found it incredibly relaxing. I actually liked it. I had this weird moment of feeling like part of the food chain…like I was bonding with these little fishies (cue Snow White music). They started me in the “Small Fish” pool, then I switched to the tank with the BIG FISH. These guys had a good bit more suction and they tickled. They also seemed to prefer the bottoms of my feet. But I liked them as much if not better than the teeny ones. I swear, it all felt so good that I think if they had had another pool with catfish in it, I might have stuck my feet in there as well. I need to check out the Aquarium restaurants in Houston again…maybe they have a tank I can sneak my feet into. Dang, that is a long title. Ewww! But also, cool! I'm jealous, sitting here with my non-fish-eaten feet.